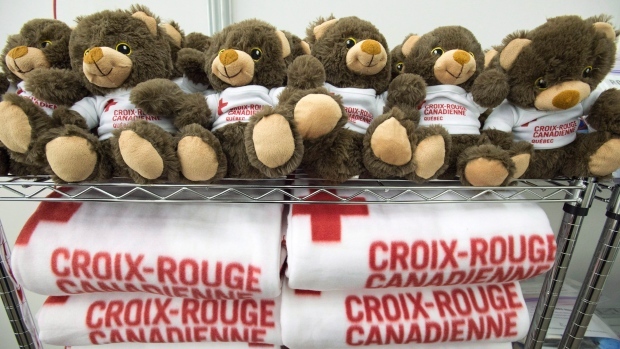 OTTAWA -- Canada should lock up child immigrants only as a "last resort" and must find alternatives to detention for such vulnerable newcomers, the Red Cross says in its latest confidential inspection report. Many of the humanitarian organization's findings -- and those highlighted in its previous annual studies -- remain "largely unaddressed," with some requiring "urgent attention," says the report obtained by The Canadian Press. The Canadian Red Cross Society's latest review of the border agency's immigration detention system, finalized last November, was released under the Access to Information Act. "The Red Cross sees persons in detention as potentially vulnerable," the report says. "Their freedom of movement has been limited to a restricted area and their security and well-being are directly under the control of the detaining authority." In 2013-14, the border agency held 10,088 immigrants -- almost one-fifth of them refugee claimants -- in a variety of facilities, including federal holding centres and provincial and municipal jails. Among these were 197 minors, held an average of about 10 days each. However, the number of young detainees is almost certainly higher because the figures do not include those who were not formally part of a detention order, but nonetheless found themselves behind bars with a parent or guardian. The border agency should detain minors in only "extremely exceptional cases" and even then for the "shortest period possible," the report says. The Red Cross calls for a national policy on holding minors that sets out treatment standards. "This policy should specifically address minors who have additional vulnerabilities, such as those who are unaccompanied, those who may have been trafficked or those who require special physical and mental health support." The report identifies the mental health of detainees as a "growing area of concern," saying the Red Cross wants to carry out a fuller study of the issue in Canadian detention facilities. During the reporting period, a woman at the British Columbia immigration holding centre attempted suicide and later died. "This death underscores the challenging nature of and obligations to respond to mental health needs in detention," the report says. The border agency did not have immediate comment on the report. However, an accompanying briefing note about a draft version of the study says the agency was in the process of developing national detention training that would include mental health and suicide prevention components.